New Orleans is known for historic sites, museums, nightlife, shopping, and parks. Your plan includes some of its best attractions: learn about all things military at The National WWII Museum, get thoroughly spooked out with a ghost and vampire tour, appreciate the extensive heritage of Jackson Square, and see the interesting displays at Audubon Butterfly Garden and Insectarium. For ratings, reviews, more things to do, and more tourist information, read New Orleans trip itinerary planning app . Manchester, UK to New Orleans is an approximately 15-hour flight. You can also do a combination of flight and bus; or do a combination of flight and car. You'll gain 6 hours traveling from Manchester to New Orleans due to the time zone difference. When traveling from Manchester in August, plan for a bit warmer days and much hotter nights in New Orleans: temperatures range from 32°C by day to 32°C at night. Finish your sightseeing early on the 11th (Sun) to allow enough time to travel to Las Vegas. Go for a jaunt from Las Vegas to Boulder City to see Hoover Dam about 50 minutes away. 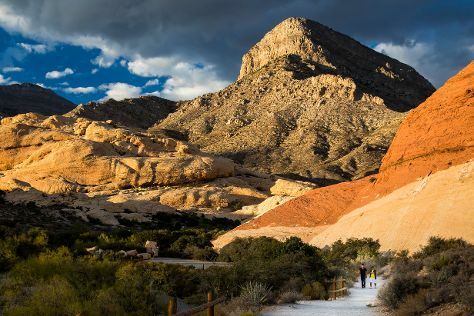 Next up on the itinerary: take in breathtaking views at Red Rock Canyon National Conservation Area, take an unforgettable tour with a helicopter tour, take in nature's colorful creations at Bellagio Conservatory & Botanical Gardens, and admire the local landmark of Bellagio Fountains. To see reviews, maps, photos, and more tourist information, refer to the Las Vegas visit planner. Traveling by flight from New Orleans to Las Vegas takes 6 hours. Alternatively, you can do a combination of bus and flight; or drive. You'll gain 2 hours traveling from New Orleans to Las Vegas due to the time zone difference. Expect a bit warmer weather when traveling from New Orleans in August: highs in Las Vegas hover around 45°C, while lows dip to 29°C. Wrap up your sightseeing on the 17th (Sat) to allow time to travel back home.